How to restart the moving truck that run out of fuel? It is imperative to conduct a vehicle inspection prior to departure to any professional driver of a moving truck. Fluids, tires pressure and condition, lights, brakes, liftgate or ramp safety mechanism, etc. need to be checked to ensure safe operation on the road. Unfortunately, embarrassing and unexpected situations can occur, which in turn can lead to unsafe and dangerous conditions, and result in hefty fines, and even accidents. In this post we will describe fast and easy remedy to bringing the truck back to life after it has stopped due to running out diesel. If for whatever reason your Los Angeles moving crew has run out of gas, whether it is a faulty gauge, driver’s negligence, or a leaking gas tank, the first thing to do is to ensure safety of the crew and surrounding public. Turn the emergency lights on and place orange cones to indicate emergency situation. One note here: if for any reason you are planning to keep emergency lights on, make sure you have relatively fresh battery, as they in conjunction with liftgate operation may seriously drain the battery. A can of engine starting fluid. Next, fill the fuel tank with newly purchased diesel and provide water to the crew members. Further, open the the hood and locate the air intake hose. Locate the prime pump witch and burp the fuel system to eliminate the air that might have entered the fuel system. Now, locate the air intake hose, loose the bolts that hold it in place and remove it. At this point, we would like to make an important disclaimer: the method of restarting the vehicle with starter fluid can damage your fuel system, so resort to it only in hopeless situations. Now, instruct one the drivers prepare to start the engine and open the starting fluid can. 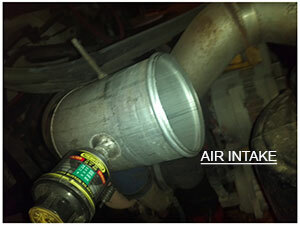 As the driver cranks the starter, spray the starting fluid inside the air intake generously and continuously. The truck will start almost immediately, however continue spraying for 5-10 seconds to ensure that diesel is pumped through the system. Be prepared for the extreme noise as you will be working in front of the revving engine and a black smoke to come out from the exhaust. Be extremely careful with the starting fluid as it is highly combustible chemical and can cause chemical and heat burns if used improperly. Read the labels to ensure safe handling. Close the hood and drive the truck to the nearest gas station! To avoid situations like these, our Los Angeles moving company adopted a habit to keep the fuel tanks at least half full and re-fuel after it drops lower.